Unusual. 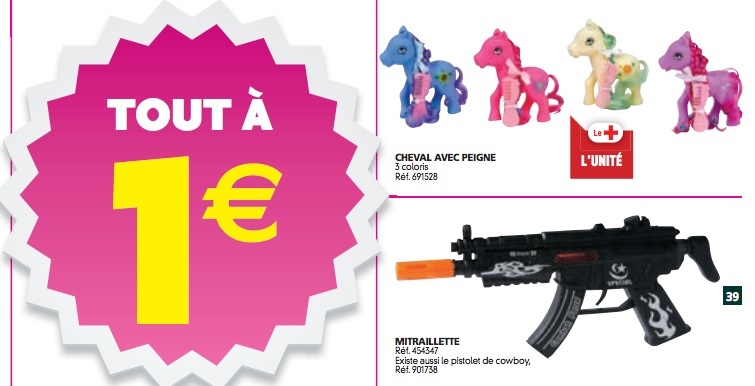 « Everything 1 euro », this is the deal that French Supermarket chain Auchan is offering for toys and children books. One euro for teddy bear flowers, a set of rings, books with rigid pages for babies, toy horses, little cars. And one euro for a machine gun… which since last weekend has caused surprise and irritation on Twitter. Its reference 454347 rhymes perfectly with AK-47. Here it is. Take a look just above the trigger. 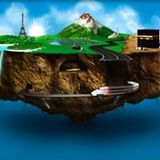 You can see a crescent and a star, both symbols of Muslim countries’ flags. Some people even see a sabre, below the first too. This machine gun looks like a Kalashnikov. It may be a replica of a weapon used by some Muslim country’s regular army. In fact, it reads « Combat force » on the magazine. 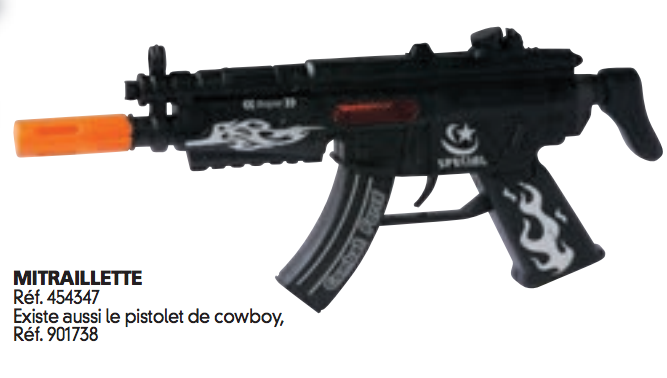 Beyond the debate about having weapons as toys, should we show concern that diversity expresses itself in such a way ? The question is open.